Today Gideon, Simon, Marcus and Steve completed their DAN O2 Provider course. Steve is currently a PADI Divemaster who's completing an PADI Open Water to Instructor career program and this course is part of his training. Pictured from left to right are Gideon, Simon, Steve, Camille and Marcus. 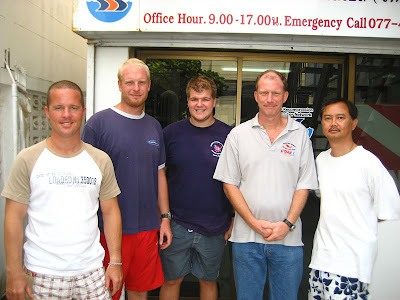 Gideon, Simon and Marcus will continue with their DAN Instructor course.